San Francisco has one of the USA's most impressive skylines. With some of the tallest skyscrapers on the West Coast, and a stunning setting on the bay, the SF skyline is even more of a marvel when seen from an aerial perspective. In this reel, contributor Glazed Aerials used a DJI Phantom 4 Pro drone to create this amazing aerial tour of the city, which includes footage of the Transamerica Pyramid, SalesForce Tower, and more. Description: Aerial Photography Done by @galazpics This amazing footage was filmed in San FRANSISCO, California. In downtown and near the Painted Ladies. You can see Coit tower, the Transamerica Pyramid, the new SalesForce Tower, the Golden Gate Bridge, and so much more!! Let me know how much you enjoy this video!! 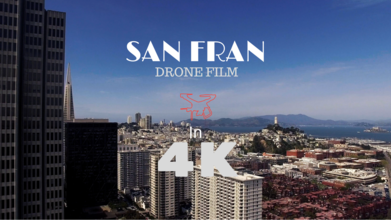 Downtown San Fransisco Views Filmed entirely by DJI Phantom 4, 4k 24fps. Check out my other videos! Song: DARK NECESSITIES by RED HOT CHILI PEPPERS. No copyright infringement intended. *Note: All footage in the video was done by the law. I always try my best to follow all laws where I am filming. Be sure to give a big thumbs up by hitting that like button below. Why don't you press that follow button while your at it? Thanks for reading to here! More videos to come... Follow for more Glazed Aerials' videos.